Flue gas analysis is used both for efficiency and emissions purposes. Thanks to advances in electronics, it is now cheaper, easier and therefore more common to monitor flue gases. Due to tightening environmental regulations, monitoring may be mandatory. The instruments used for analysis can be inexpensive small hand-held devices that produce reasonable accuracy, to larger permanently installed units that are capable of producing lab quality results on a continuous basis. The combustion process inputs are fuel and air. 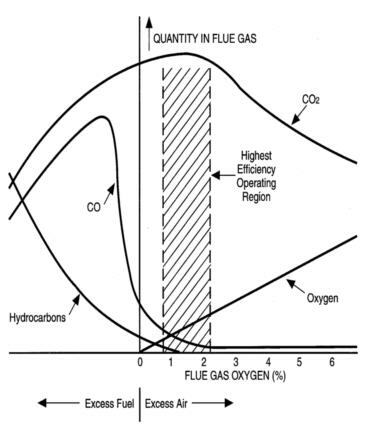 Therefore, the components of flue gas are primarily made up of compounds of oxygen, nitrogen, hydrogen and carbon. The components that are of interest because they effect efficiency are primarily oxygen (O) and carbon (C). The components that are of interest from an environmental perspective are nitrous-oxides (NOx), carbon-dioxide (CO2), carbon-monoxide (CO) and sulfur-dioxide (SO2) – if the fuel source is oil or coal. NOTE: The Orsat was the instrument of choice for performing flue gas analysis before the advent of electronic instruments. Although antiquated by today’s electronic instruments, you may still hear this name used ‘generically’ (by older people) to refer to a flue gas analyzer or actually find one in use in the field. 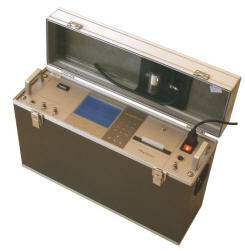 The original Bacharach test kit is a portable, non-electronic device based on the concept of the Orsat for measuring CO and CO2. Bacharach now also offers several electronic instruments. See link below in the Manufacturer’s Section. Flue Gas Analysis is performed by inserting a probe into the flue of the furnace, boiler, etc., between the last heat exchanger and draft diverter or any source of make-up air that could enter the flue that did not pass through the combustion process. This is known as ‘in-situ’ testing. It is also necessary to take a combustion air temperature measurement, or ambient temperature if that is the source of combustion air. 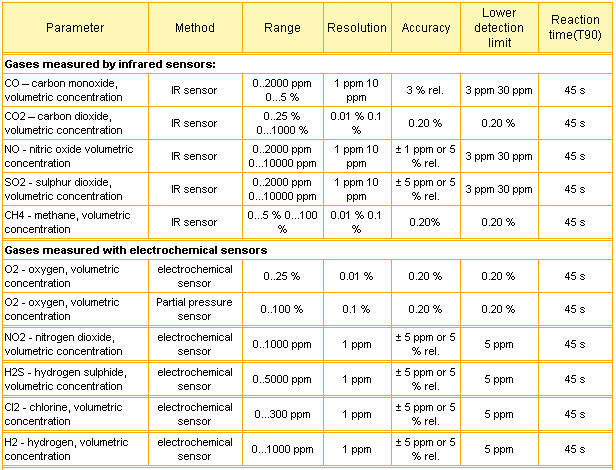 Depending on the gas being measured, most probes today are either infra-red or some sort of electrochemical. Not all gases are directly measured by all meters; some values are calculated based on gases that are measured and then factored based on input fuel properties. Not all analyzers use ‘in-situ’ probes. Some units pump flue gases through a tube to the instrument. This is more typical of continuous monitoring equipment and for very large systems where it is not easy to reach a spot in the flue to insert a probe or locate a portable meter. The tube may need to be heated in order to keep the product to be measured from condensing out, such as NO2, SO2, and HCl. In other cases, the flue gases must be cooled and dried to prevent moisture damage to the probe. Instruments use a device called a ‘Peltier Cooler’ which is an electrochemical device that produces a cool surface that condenses any moisture out of the flue gas before it reaches the measuring sensor. Probes and sensors do not last forever; some electrochemical sensors are consumed by the measurement process and others will wear-out with use as they are exposed to high temperatures and corrosive gases. IR Sensors are therefore becoming more popular for many applications, but they are more expensive, not always as accurate and are affected by dirt, fogged lenses and other application issues with where and how they can be used. Steady progress will likely reduce/eliminate most of these issues. Measurement values are either provided in part per million (ppm) or percentage (%) depending on the size of the reading. Larger numbers, such as oxygen and carbon-dioxide are generally provided in percentage and small numbers, such as NOx and carbon-monoxide are provided in ppm. 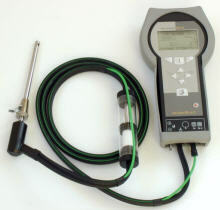 The follow specs are from a Madur portable flue gas analyzer; it is used here because it illustrates the type of sensor/probe used for several common gases and the type and accuracy of the measurement that it provides. Most instruments have internal memory that store readings for later downloading to a computer; some also include printers to produce hard copy reports in addition to the stored information. The most common measurement for the purposes of efficiency are oxygen (O) or carbon-dioxide (CO2) and temperature. For a given fuel type, it is possible to calculate the percent O if CO2 is measured, or to calculate CO2 if O is measured. Another common indicator is CO; if O is high, there won’t be any significant CO. Measurable CO means the unit is starved for O or there is something very wrong with the flame. The O and/or CO2 measurement along with the temperature of the flue gas and the combustion air temperature, are the needed variables to determine combustion efficiency. Electronic instruments are programmed to calculate and display efficiency directly. In order to see the affect of excess oxygen on combustion efficiency or to manually calculate efficiency from Table data, see Flue Gas Analysis Table for Natural Gas. The emission of primary concern from the combustion of natural gas is NOx. Typical uncontrolled NOx from natural gas boilers are 70 to well over 100 ppm. Regulations in California have tightened substantially over recent years, requiring some boilers to operate at less than 9 ppm. Several other States and Canada have requirements for under 50 ppm for larger boilers. For information about how to control boiler emissions, see Emissions Control. Go to their web site at www.madurusa.com. Be sure to check out the training section of their web site. Bacharach Combustion Testing Kits offer you the most economical means of testing the efficiency of burners during installation or servicing. 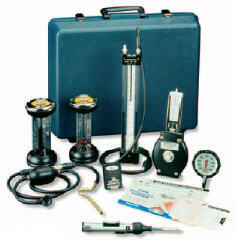 Each kit is designed to specifically test oil or gas burners with the service technician in mind. he PCA is designed for heavier duty residential and commercial testing. It is capable of printing test results and also has a memory feature so that test results can be saved at the push of a button and printed later. This is particularly important when testing power burners or modulating equipment. The PCA also has a much stronger pump which will pull against high stack draft conditions and can be used with an optional 20 foot hose and probe extension. 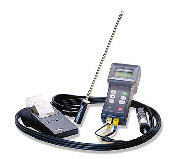 The PCA also has a “hydrogen compensated” CO sensor which provides more accurate CO readings in flue gas samples. All of the less expensive analyzers on the market have non compensated CO sensors which are cross sensitive to hydrogen. The amount of hydrogen produced in the combustion process is dependent on flame conditions and is extremely variable particularly on commercial burners where higher flame temperatures may result in hydrogen production. Another advantage to the PCA is that all the readings are displayed in the screen at the same time. The Unigas instruments are compact flue gas analyzers for combustion analysis, boiler tuning, emissions monitoring and related tests and inspections. 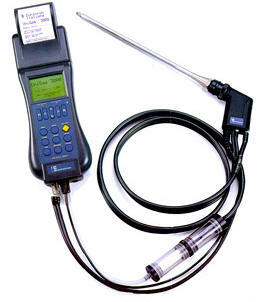 The basic analyzer, Unigas 2000, uses two electrochemical sensors to read the oxygen and carbon monoxide concentrations. These values are used together with flue gas and combustion air temperatures to calculate the efficiency, excess air and CO2 compliance. The Unigas can be used for most common fuels including natural gas, LPG, oil and kerosene, coal, coke and anthracite. Up to six additional fuels can be programmed by the operator. The gas sensors are built into the handset. The gas is sampled via a probe which is inserted into the flue. A small pump in the handset draws the flue gas into the analyzer. The probe includes a K type thermocouple sensor and there is also an additional separate connection on the handset for an external resistance thermometer to be used for the ambient air temperature.